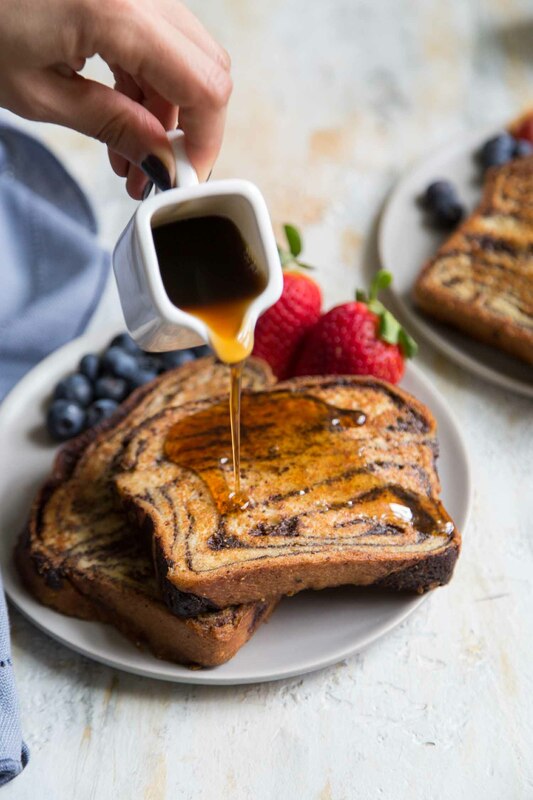 This Babka French Toast uses homemade chocolate babka and gently soaks it in a vanilla and cinnamon spiced custard mixture. I refuse to order French toast when I’m out for breakfast or brunch. I’ve had such bad experiences in the past. Most of the time, the bread is soaked for too long or the custard is super eggy. I once had French toast that looked more like an omelette. That’s just wrong. This chocolate babka French toast will right all those past mistakes. French toast is very simple to make at home. It’s the kind of breakfast you can whip up in a breeze, without much prep. It uses kitchen staples you likely already have: sliced bread, milk, and eggs. I believe it’s the added spices and flavors that makes an excellent French toast stand out. Common add-ins are cinnamon, nutmeg, and/or vanilla. For an exciting pop of flavor, you can include citrus zest or perhaps a splash of alcohol (like rum, brandy, or orange liqueur). Remember that chocolate babka I made last year? I made some last weekend and that’s what I used for this recipe. Since I’m using chocolate babka, I opted to keep my added spices simple. I added ground cinnamon and a touch of vanilla extract. After several trials, I have perfected my French toast custard/soaking liquid ratio. I use four large whole eggs with one cup of whole milk. This is enough soaking liquid mixture for 6 thick slices of bread. It’s best to keep the custard mixture in a wide, shallow bowl (pasta dishes and pie plates work well!). Make sure the bowl is wide enough to accommodate the width of the bread. Lightly dip the bread into the custard mixture, making sure both sides are coated. Be careful not to soak the babka bread too long, otherwise the bread might fall apart and be difficult to transfer to the hot skillet. The learned the best tip about cooking French toast through Serious Eats. After cooking one side of the toast, sprinkle a little bit of sugar on the raw side before flipping. Normally the side of the bread cooked first gets the richer, golden crust. Adding the sprinkle of sugar helps to create a nice browned, almost caramel finish to the second side of the toast. 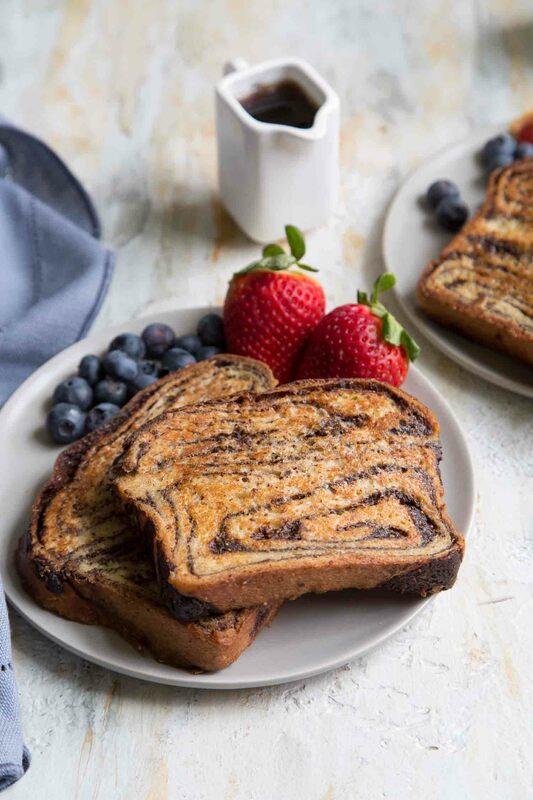 It’s subtle, but just enough to make this babka French toast my favorite. 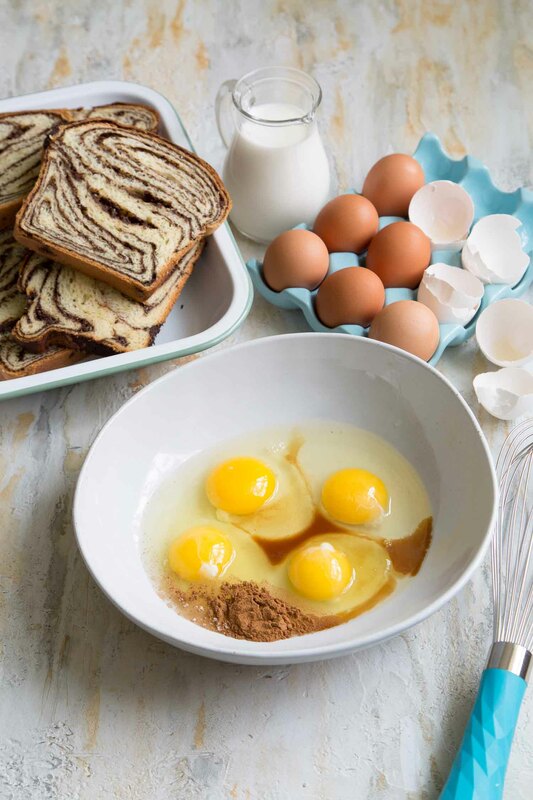 I foresee many more babka French toast variations in my future! 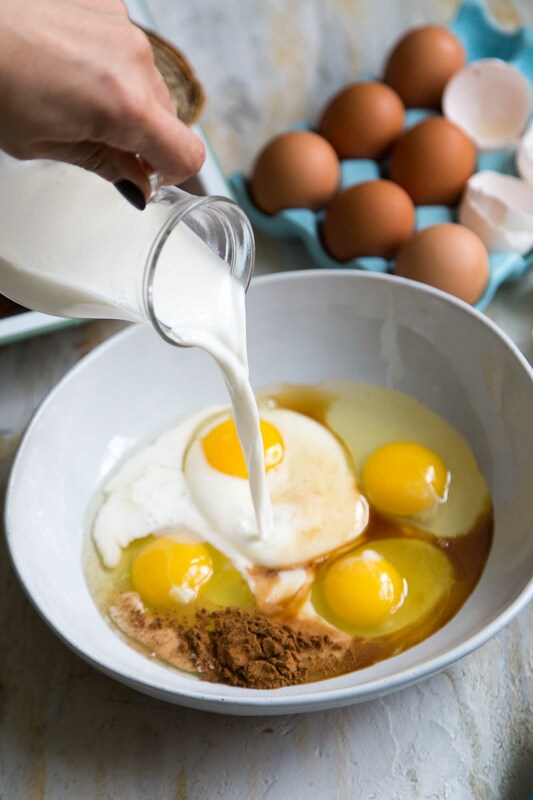 Whisk together eggs, milk, vanilla, cinnamon, and salt until throughly blended. (Alternatively, use an immersion blender to mix together). Pour into a shallow bowl wide enough for bread. Set a large skillet over medium heat and melt about a tablespoon of butter. Working with one slice of bread at a time, dip bread into egg mixture. Turn to coat other side of bread. Allow any excess liquid to drain. Cook bread on hot skillet until browned on one side, about 2 minutes. Before flipping, sprinkle two pinches of sugar on exposed side of bread. Flip and brown the other side, another 2 minutes. Repeat with remaining bread. Add additional butter to skillet as needed. Serve French toast warm with maple syrup. I used this chocolate babka recipe. Sub in store bought babka, brioche, Japanese milk bread, or any enriched yeasted sliced bread. 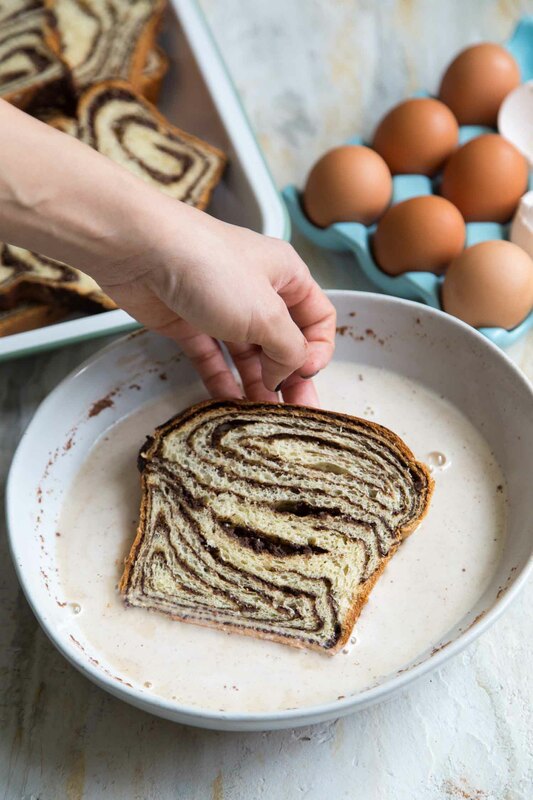 What a delicious and creative idea for left over babka!